This guide covers managing your infrastructure, cloud, and containers providers and system managers in Red Hat CloudForms. Red Hat CloudForms can manage a variety of external environments, known as providers and managers. A provider or manager is any system that CloudForms integrates with for the purpose of collecting data and performing operations. In CloudForms, a provider is an external virtualization, cloud, or containers environment that manages multiple virtual machines or instances residing on multiple hosts. One example is Red Hat Virtualization, a platform that manages multiple hosts and virtual machines. In CloudForms, a manager is an external management environment that manages more than one type of resource. One example of a manager is OpenStack, which manages infrastucture, cloud, network, and storage resources. For information on working with the resources contained by a provider or manager, see Managing Infrastructure and Inventory. In Red Hat CloudForms, an infrastructure provider is a virtual infrastructure environment that you can add to a CloudForms appliance to manage and interact with the resources in that environment. This chapter describes the different types of infrastructure providers that you can add to CloudForms, and how to manage them. Infrastructure providers can be either discovered automatically by CloudForms, or added individually. Invalid: Authentication credentials are invalid. In addition to individually adding providers, you can also discover all infrastructure providers in a given subnet range. Click (Configuration), then click (Discover Infrastructure Providers). Select the types of provider to discover. Enter a Subnet Range of IP addresses starting with a From Address and ending with a To Address. The cursor automatically advances as you complete each octet. The appliance searches for all infrastructure providers in the specified subnet range, and adds them to the user interface. However, before you can manage the providers added via discovery, you must edit each provider and specify authentication details. To use a Red Hat Virtualization provider, add it to the appliance and authenticate its hosts. You can also configure capacity and utilization data collection to help track usage and find common issues. In CloudForms, enable the capacity and utilization server roles from the settings menu, in Configuration → Server → Server Control. For more information on capacity and utilization collection, see Assigning the Capacity and Utilization Server Roles in the Deployment Planning Guide. For information on selecting clusters and datastores used to collect data, see Capacity and Utilization Collections in the General Configuration Guide. To install the Data Warehouse and Reports components in a Red Hat Virtualization environment, see the Data Warehouse Guide. To create a CloudForms user in the Data Warehouse database, see Data Collection for Red Hat Enterprise Virtualization in the Deployment Planning Guide. After initial installation and creation of a Red Hat CloudForms environment, add a Red Hat Virtualization provider to the appliance. Click (Configuration), then click (Add a New Infrastructure Provider). Select Red Hat Virtualization from the Type list. Select the appropriate Zone for the provider. If you do not specify a zone, it is set to default. Enter the Hostname or IPv4 or IPv6 address of the Red Hat Virtualization Manager. The Hostname must be a unique fully qualified domain name. Enter the API Port if your provider uses a non-standard port for access. Select Yes or No to Verify TLS Certificates to specify whether to authenticate securely to the provider using TLS. If you select Yes for Verify TLS Certificates, you can either paste a custom certificate in the Trusted CA Certificates field in PEM format, or leave the Trusted CA Certificates field empty if your Red Hat Virtualization provider has a trusted Certificate Authority. Enter the user name (formatted as admin@internal) in the Username field. Confirm the password in the Confirm Password field. 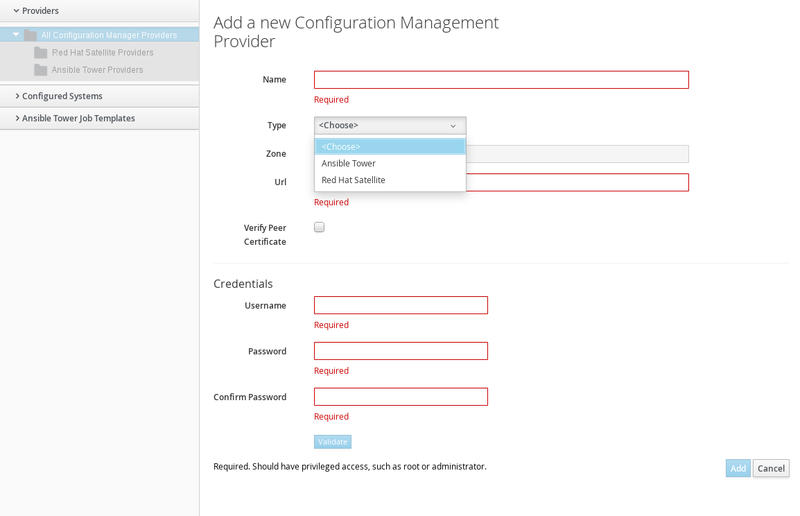 Click Validate to confirm CloudForms can connect to the Red Hat Virtualization Manager. To collect capacity and utilization data from a Red Hat Virtualization provider, the capacity and utilization server roles must be enabled in CloudForms. The Red Hat Virtualization environment must also contain the Data Warehouse and Reports components and a CloudForms user. Specific clusters, hosts, and datastores can also be configured for collection. See Section 1.2.1, “Enabling Red Hat Virtualization Capacity and Utilization Data Collection” for configuration details. Enter the database hostname or IPv4 or IPv6 address in Hostname. Enter the database user name in the Username field. Enter the user password in the Password field. Confirm the user password in the Confirm Password field. Click Validate to confirm CloudForms can connect to the database. Click Add to finish adding the Red Hat Virtualization provider. After adding a Red Hat Virtualization infrastructure provider, you must authenticate its hosts to enable full functionality. Click on a provider to display its summary screen. On the summary screen, click Hosts in the Relationships information box to display the hosts on that provider. Select the hosts to authenticate. You can select all hosts using the Check All option. Default: This field is mandatory. Users should have privileged access such as, root or administrator. Remote Login: Credentials for this field are required if SSH login is disabled for the Default account. Web Services: This tab is used for access to Web Services in Red Hat Virtualization. IPMI: This tab is used for access to IPMI. Select a host from the Select Host to validate against list. If required, enter credentials for Remote Login, Web Services, and IPMI in their respective tabs; click Validate. Select another host to validate each of these credentials against. Enable an OpenStack Infrastructure provider by adding it to the appliance. After initial installation and creation of a Red Hat CloudForms environment, add an OpenStack infrastructure provider to the appliance. Red Hat CloudForms supports operating with the OpenStack admin tenant. When creating an OpenStack infrastructure provider in Red Hat CloudForms, select the OpenStack infrastructure provider’s admin user because it is the default administrator of the OpenStack admin tenant. When using the admin credentials, a user in Red Hat CloudForms provisions into the admin tenant, and sees images, networks, and instances that are associated with the admin tenant. You can set whether Red Hat CloudForms should use the Telemetry service or Advanced Message Queueing Protocol (AMQP) for event monitoring. If you choose Telemetry, you should first configure the ceilometer service on the undercloud to store events. See Section 1.3.1.1, “Configuring the Undercloud to Store Events” for instructions. For more information, see OpenStack Telemetry (ceilometer) in the Red Hat OpenStack Platform Architecture Guide. To authenticate the provider using a self-signed Certificate Authority (CA), configure the CloudForms appliance to trust the certificate using the steps in Section A.1, “Using a Self-Signed CA Certificate” before adding the provider. Enter the Name of the provider to add. The Name is how the device is labeled in the console. Select OpenStack Platform Director from the Type list. Select the API Version of your OpenStack provider’s Keystone service from the list. The default is Keystone v2. With Keystone API v3, domains are used to determine administrative boundaries of service entities in OpenStack. Domains allow you to group users together for various purposes, such as setting domain-specific configuration or security options. For more information, see OpenStack Identity (keystone) in the Red Hat OpenStack Platform Architecture Guide. The provider you are creating will be able to see projects for the given domain only. To see projects for other domains, add it as another cloud provider. For more information on domain management in OpenStack, see Domain Management in the Red Hat OpenStack Platform Users and Identity Management Guide. Select the appropriate Zone for the provider. By default, the zone is set to default. For more information, see the definition of host aggregates and availability zones in OpenStack Compute (nova) in the Red Hat OpenStack Platform Architecture Guide. SSL without validation: Authenticate the provider insecurely using SSL. SSL: Authenticate the provider securely using a trusted Certificate Authority. Select this option if the provider has a valid SSL certificate and it is signed by a trusted Certificate Authority. No further configuration is required for this option. This is the recommended authentication method. Non-SSL: Connect to the provider insecurely using only HTTP protocol, without SSL. In API Port, set the public port used by the OpenStack Keystone service. By default, OpenStack uses port 5000 for this. Select the appropriate Security Protocol used for authenticating with your OpenStack provider. In the Username field, enter the name of an OpenStack user with privileged access (for example, admin). Then, provide its corresponding password in the Password and Confirm Password fields. Click Validate to confirm Red Hat CloudForms can connect to the OpenStack provider. Next, configure how Red Hat CloudForms should receive events from the OpenStack provider. Click the Events tab in the Endpoints section to start. To use the Telemetry service of the OpenStack provider, select Ceilometer. Before you do so, the provider must first be configured accordingly. See Section 1.3.1.1, “Configuring the Undercloud to Store Events” for details. If you prefer to use the AMQP Messaging bus instead, select AMQP. When you do: In Hostname (or IPv4 or IPv6 address) (of the Events tab, under Endpoints), enter the public IP or fully qualified domain name of the AMQP host. In the API Port, set the public port used by AMQP. By default, OpenStack uses port 5672 for this. Click Validate to confirm the credentials. You can also configure SSH access to all hosts managed by the OpenStack infrastructure provider. To do so, click on the RSA key pair tab in the Endpoints section. From there, enter the Username of an account with privileged access. If you selected SSL in Endpoints > Default > Security Protocol earlier, use the Browse button to find and set a private key. Click Add after configuring the infrastructure provider. Red Hat CloudForms requires that the adminURL endpoint for all OpenStack services be on a non-private network. Accordingly, assign the adminURL endpoint an IP address of something other than 192.168.x.x. The adminURL endpoint must be accessible to the Red Hat CloudForms appliance that is responsible for collecting inventory and gathering metrics from the OpenStack environment. Additionally, all the Keystone endpoints must be accessible, otherwise refresh will fail. To allow Red Hat CloudForms to receive events from a Red Hat OpenStack Platform environment, you must configure the notification_driver option for the Compute service and Orchestration service in that environment. To do so, edit undercloud.conf, and set store_events to true before installing the undercloud. See Installing the Undercloud and Configuring the Director in Red Hat OpenStack Platform Director Installation and Usage for related details. To use a VMware vCenter provider, add it to the appliance and authenticate its hosts. After initial installation and creation of a Red Hat CloudForms environment, add a VMware vCenter provider to the appliance. Select VMware vCenter from the Type list. Enter the Host Name or IP address(IPv4 or IPv6) of the provider. Enter the user name in the Username field. Click Validate to confirm Red Hat CloudForms can connect to the VMware vCenter. After adding a VMware vCenter infrastructure provider, you must authenticate its hosts to enable full functionality. You can use administrator credentials, or create another user assigned to a role created for Red Hat CloudForms. See the VMware documentation for instructions on how to create a role. Datacenter: At the Datacenter the Red Hat CloudForms user/group must have at least the read-only role at the Datacenter level (Not Propagated) to be able to see the datacenter. Without this access, relationships cannot be made. Specifically, the datastores will not show up. Cluster: Each Cluster that the Red Hat CloudForms needs access to must have the new role assigned and propagated. Folders: Each Folder that Red Hat CloudForms needs access to must have the new role assigned and propagated. Datastores: Each Datastore that Red Hat CloudForms needs access to must have the new role assigned and propagated. Networking: Each vLAN or Port Group that Red Hat CloudForms needs access to must have the new role assigned and propagated. The procedure below describes how to authenticate the VMware vCenter hosts. Click Validate to confirm Red Hat CloudForms can connect to the VMware vCenter host. If editing multiple hosts, select a host from the Select Host to validate against list; provide the VMware ESXi login credentials and click Validate. To use a Microsoft System Center Virtual Machine Manager (SCVMM) provider, add it to the appliance and set up the SCVMM server for authentication. To use a SCVMM provider, you must have at least one network adapter available for communication between the host and the SCVMM management server. Make sure that Used by Management is checked for this network adapter in the SCVMM host properties. Before you can add a Microsoft SCVMM provider to your Red Hat CloudForms environment, you must enable WinRM to listen for HTTP traffic on Microsoft SCVMM servers. You must also set the appropriate execution policy on the Microsoft SCVMM server to allow PowerShell scripts from the appliance to run remotely. Log in to the Microsoft SCVMM server. Enable remote script execution on the SCVMM server using the Set-ExecutionPolicy cmdlet. For more information on SCVMM remote script execution policies, see Using the Set-ExecutionPolicy Cmdlet. If PowerShell returns an error, search for log_dos_error_results in the evm.log and scvmm.log files for information. After initial installation and creation of a Red Hat CloudForms environment, add a Microsoft System Center Virtual Machine Manager (SCVMM) provider to the appliance. Select Microsoft System Center VMM from the Type list. Select Kerberos or Basic (SSL) from the Security Protocol list. Enter the user name and realm in the Username field. Enter the password again in the Confirm Password field. Click Validate to confirm that Red Hat CloudForms can connect to the Microsoft System Center Virtual Machine Manager. Refresh a provider to find other resources related to it. Use Refresh after initial discovery to get the latest data about the provider and the virtual machines it can access. Ensure the provider has credentials to do this. If the providers were added using Discovery, add credentials using (Edit Selected Infrastructure Provider). Select the providers to refresh. Apply tags to all providers to categorize them together at the same time. Navigate to Infrastructure → Providers. Check the providers to tag. In the Tag Assignment area, select a customer tag to assign from the first list, then select a value to assign from the second list. Select more tags as required; click (Save). From a list of providers, you can review a specific provider by clicking on it. This displays various options to access provider information. There are two methods of viewing an infrastructure provider’s details: the summary screen (default) and the dashboard screen. Use the summary and dashboard buttons to toggle between views. Both the summary and dashboard screens contain a taskbar with Reload, Configuration, Policy, Monitoring, and Authentication buttons to manage the selected provider. The provider summary screen displays information about the provider in table format. Provider accordion: Displays details about the provider’s Properties and Relationships on the sidebar. Click to expand these lists. Provider summary: Displays a provider’s Properties, Status, Relationships, and Smart Management. Click on an item in the Relationships table to see more information about that entity. Number of clusters, hosts, virtual machines, templates, datastores, resource pools, and other entities on the provider. Click on an entity to see more information about that item. Click the infrastructure provider to view. To access the dashboard view, click (Dashboard view). To return to the summary view, click (Summary view). If a provider has been decommissioned or requires some troubleshooting, it might require deletion from the VMDB. Deleting a provider removes the account information from Red Hat CloudForms console. You will no longer be able to view any associated history including chargeback reports generated for the deleted provider. Additionally, if Red Hat CloudForms is the database of record, deleting providers would become a major problem for the other systems relying on it for accurate and consistent billing information. Review all the dependencies carefully before deleting a provider. Select the check box for the provider to delete. Click (Configuration), then (Remove Infrastructure Providers from the VMDB). View the timeline of events for the virtual machines registered to a provider. Click (Monitoring), and then (Timelines)from the taskbar, or from the provider accordion, click Properties → Timeline. 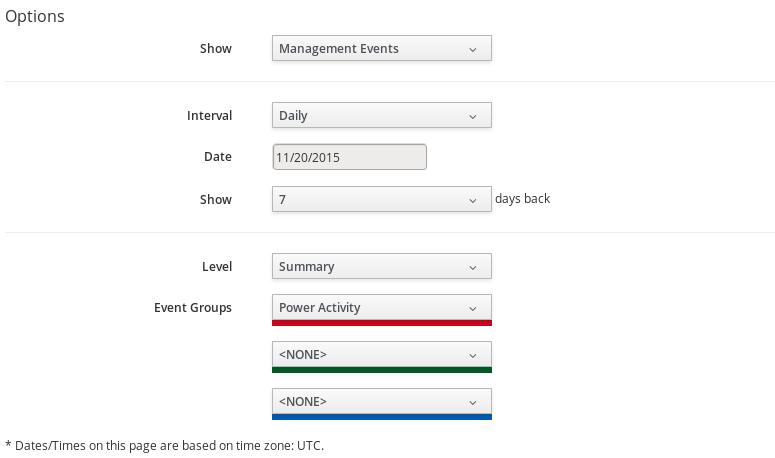 Use Show to select regular Management Events or Policy Events. The three Event Groups lists allow you to select different groups of events to display. Each has its own color. From the Level list, select a Summary event, or a Detail list of events. For example, the detail level of a Power On event might include the power on request, the starting event, and the actual Power On event. If you select Summary, only the Power On event displays in the timeline. Access a tree view of the hosts and clusters for a provider from the Provider Summary. Click the provider to view the hosts and clusters. Click on the Relationships accordion, then click Hosts & Clusters. Access a tree view of the virtual machines and templates for a provider from the Provider Summary. Click the provider to view the virtual machines and templates. From accordion menu, click Relationships, then click VMs & Templates. In CloudForms, a configuration management provider is a systems management product that you can add to a CloudForms appliance to manage the lifecycle of your resources. Configuration management providers are useful for uniformly applying changes and updates across providers, and for recording and reporting status and change activity. They can also help eliminate the confusion and error brought about by the existence of different providers. This chapter describes the different types of configuration management providers available to CloudForms, and how to manage them. Configuration management providers must be added individually to CloudForms. Navigate to Configuration → Management. In Red Hat CloudForms, an automation management provider is a management tool that integrates with CloudForms to simplify automation operations for your resources. This chapter describes the automation management providers that you can use with Red Hat CloudForms, and how to work with them. Automate enables real-time, bi-directional process integration. This provides you with a method to implement adaptive automation for management events and administrative or operational activities. Ansible integration delivers out-of-the-box support for backing service, alert and policy actions using Ansible playbooks. Sync your existing playbook repositories with CloudForms, add credentials to access providers, and create service catalog items for actions ranging from creating and retiring VMs, updating security software, or adding additional disks when space runs low. Ansible Tower is a management tool integrated with CloudForms, designed to help automate infrastructure operations utilizing existing Ansible Tower providers in your inventory. 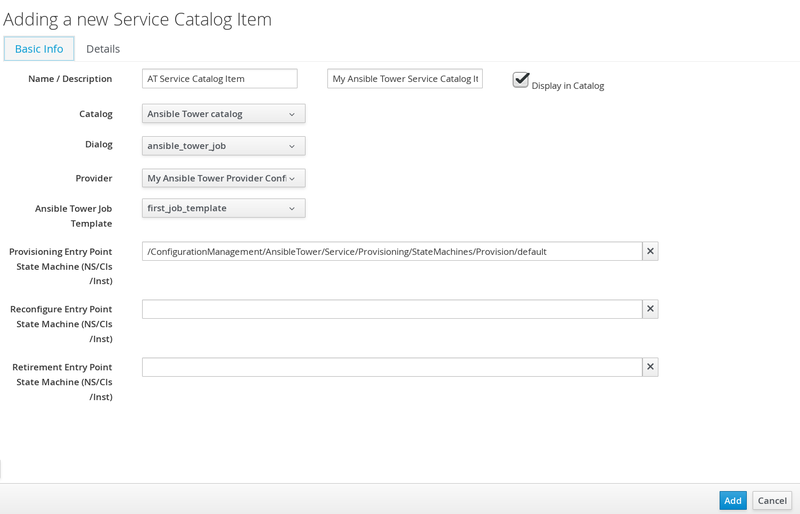 CloudForms allows you to execute Ansible Tower jobs using service catalogs and Automate. Using Ansible Tower, you can schedule Ansible playbook runs and monitor current and historical results, allowing for troubleshooting or identification of issues before they occur. Ansible integrates with Red Hat CloudForms to provide automation solutions, using playbooks, for Service, Policy and Alert actions. Ansible playbooks consist of series of plays or tasks that define automation across a set of hosts, known as the inventory. Services - allow a playbook to back a CloudForms service catalog item. Control Actions - CloudForms policies can execute playbooks as actions based on events from providers. Control Alerts - set a playbook to launch prompted by a CloudForms alert. Enable the Embedded Ansible server role. Add a source control repository that contains your playbooks. Establish credentials with your inventory. Back your services, alerts and policies using available playbooks. In Red Hat CloudForms, the Embedded Ansible role is disabled by default. Enable this server role to utilize Ansible Automation Inside. Configure your CloudForms appliance network identity (hostname/IP address) before enabling the Embedded Ansible server role. Restart the evmserverd service on the appliance with the enabled Embedded Ansible server role after making any changes to the hostname or IP address. Navigate to the settings menu, then Configuration → Settings. Select the desired server under Zones. Set the Server Role for Embedded Ansible to On. Verify that the Embedded Ansible worker has started to utilize its features. Navigate to the settings menu, then Configuration → Diagnostics and click on the desired server. Click on the Workers tab. A table of all workers and current status will appear from which you can confirm the state of your embedded Ansible worker. Add a repository so that Red Hat CloudForms can discover and make available your playbooks. Navigate to Automation → Ansible → Repositories. Provide a Repository Name in the Name field. Add a description for the repository in the Description field. Select an SCM Type from the drop-down menu. Add a URL or IP Address for the repository. Select the appropriate SCM Credentials from the drop-down menu. Provide a branch name in the SCM Branch field. Check the appropriate box for any SCM Update Options. Once you have synced a repository, its playbooks will become available to CloudForms. Red Hat CloudForms allows you to refresh a targeted playbook repository or all repositories in your inventory to ensure your playbooks are current. Click (Configuration), then (Refresh this Repository). Check those repositories to refresh. Click Check All to select all repositories. Click (Configuration), then (Refresh Selected Ansible Repositories). Red Hat CloudForms can store credentials used by playbooks. Credentials saved in CloudForms are matched and executed with a playbook when run. If both CloudForms and a VMware provider are located in the same IPv6-only network, use a DNS-resolvable hostname for the VMware provider in the vCenter Host field when adding credentials. Navigate to Automation → Ansible → Credentials. Click (Configuration), then (Add a New Credential). Provide a Name for the credential. Select the Credential Type. Additional fields will appear depending on the type chosen. Navigate to Automation → Ansible Tower → Explorer and click on the Providers accordion tab. Add a Zone for the provider. Click Validate to verify credentials. Navigate to Automation → Ansible Tower → Explorer and click the Providers accordion tab. Navigate to Automation → Ansible Tower → Explorer. select the Providers accordion menu to display a list of All Ansible Tower Providers. Similarly, all discovered job templates are accessed under the provider by expanding the Automation → Ansible Tower → Explorer → Job Templates accordion menu. Navigate to Automation → Ansible Tower → Explorer → Configured Systems. Under All Ansible Tower Configured Systems, select Ansible Tower Configured Systems to display a list. Navigate to Automation → Ansible Tower → Jobs. Add configuration information for Reconfigure Entry Point and Retirement Entry Point as applicable. Ansible Tower must be able to reach virtual machines or instances deployed by Red Hat CloudForms at the IP level. Navigate to Automation → Automate → Customization. In CloudForms, a cloud provider is a cloud computing environment that you can add to a CloudForms appliance to manage and interact with the resources in that environment. This chapter describes the different types of cloud providers that you can add to CloudForms, and how to manage them. Most cloud providers are added individually to CloudForms. Additionally, Amazon EC2 and Azure cloud providers can be discovered automatically by CloudForms. Red Hat CloudForms supports operating with the OpenStack admin tenant. When creating an OpenStack provider in Red Hat CloudForms, select the OpenStack provider’s admin user because it is the default administrator of the OpenStack admin tenant. When using the admin credentials, a user in Red Hat CloudForms provisions into the admin tenant, and sees images, networks, and instances that are associated with the admin tenant. In OpenStack, you must add admin as a member of all tenants that users want to access and use in CloudForms. See Tenancy in the Deployment Planning Guide for more details on tenancy in CloudForms. When adding an OpenStack cloud or infrastructure provider, you can enable tenant mapping in CloudForms to map any existing tenants from that provider. This means CloudForms will create new cloud tenants to match each existing OpenStack tenant; each new cloud tenant and its corresponding OpenStack tenant will have identical resources assignments, with the exception of quotas. Tenant quotas are not synchronized between CloudForms and OpenStack, and are available for reporting purposes only. You can manage quotas in CloudForms but this will not affect the quotas created in OpenStack. During a provider refresh, CloudForms will also check for any changes to the tenant list in OpenStack. CloudForms will create new cloud tenants to match any new tenants, and delete any cloud tenants whose corresponding OpenStack tenants no longer exist. CloudForms will also replicate any changes to OpenStack tenants to their corresponding cloud tenants. You can set whether Red Hat CloudForms should use the Telemetry service or Advanced Message Queueing Protocol (AMQP) for event monitoring. If you choose Telemetry, you should first configure the ceilometer service on the overcloud to store events. See Section 4.1.1.1, “Configuring the Overcloud to Store Events” for instructions. For more information, see OpenStack Telemetry (ceilometer) in the Red Hat OpenStack Platform Architecture Guide. Navigate to Compute → Clouds → Providers. Click (Configuration), then click (Add a New Cloud Provider). From the Type list, select OpenStack. Select the appropriate API Version from the list. The default is Keystone v2. If you select Keystone v3, enter the Keystone V3 Domain ID that Red Hat CloudForms should use. This is the domain of the user account you will be specifying later in the Default tab. If domains are not configured in the provider, enter default. Enter a region number in Region. By default, tenant mapping is disabled. To enable it, set Tenant Mapping Enabled to Yes. In Hostname (or IPv4 or IPv6 address), enter the public IP or fully qualified domain name of the OpenStack Keystone service. The hostname required here is also the OS_AUTH_URL value in the ~/overcloudrc file generated by the director (see Accessing the Overcloud in Red Hat OpenStack Platform Director Installation and Usage), or the ~/keystonerc_admin file generated by Packstack (see Evaluating OpenStack: Single-Node Deployment). In the Username field, enter the name of a user in the OpenStack environment. In environments that use Keystone v3 authentication, the user must have the admin role for the relevant domain. In the Password and Confirm Password fields, enter the password for the user. To use the Telemetry service of the OpenStack provider, select Ceilometer. Before you do so, the provider must first be configured accordingly. See Section 4.1.1.1, “Configuring the Overcloud to Store Events” for details. Click Add after configuring the cloud provider. To collect inventory and metrics from an OpenStack environment, the Red Hat CloudForms appliance requires that the adminURL endpoint for the OpenStack environment be on a non-private network. Hence, the OpenStack adminURL endpoint should be assigned an IP address other than 192.168.x.x. Additionally, all the Keystone endpoints must be accessible, otherwise refresh will fail. Collecting capacity and utilization data from an OpenStack cloud provider requires selecting the Collect for All Clusters option under Configuration, in the settings menu. For information, see Capacity and Utilization Collections in the General Configuration Guide. By default, the Telemetry service does not store events emitted by other services in a Red Hat OpenStack Platform environment. The following procedure outlines how to enable the Telemetry service on your OpenStack cloud provider to store such events. This ensures that events are exposed to Red Hat CloudForms when a Red Hat OpenStack Platform environment is added as a cloud provider. Log in to the undercloud host. Please see the below NOTE. Log in to your Controller node. Passing the newly created environment file to the overcloud deployment is environment specific and requires executing commands in particular order depending on use of variables. For further information please see Director Installation and Usage in the Red Hat OpenStack Platform documentation. Red Hat CloudForms supports Microsoft Azure providers. Before CloudForms can be authenticated to Microsoft Azure, you must complete a series of prerequisite steps using the Azure portal; see Create Active Directory application and service principal account using the Azure portal. Follow the steps to set up an Azure Active Directory (Azure AD) and assign the required permissions to it, then create an Azure Active Directory application, and obtain the Application ID (Client ID), Directory ID (Tenant ID), Subscription ID, and Key Value (Client Key) that are required to add and connect to the Azure instance as a provider in CloudForms. Currently, all of these steps can be performed using either the Azure Resource Manager or Service Manager (Classic) mode. The Application ID obtained during Get Application ID and Authentication Key is your Client ID. In the same section, after providing a description and a duration for the key, the VALUE displayed after clicking Save is your Client Key. If you choose an expiring key, make sure to note the expiration date, as you will need to generate a new key before that day in order to avoid an interruption. The Directory ID obtained during Get Tenant ID is your Tenant ID. In Azure Active Directory (Azure AD), a tenant is a dedicated instance of the Azure AD service and is representative of an organization. It houses the users in a company and the information about them - their user profile data, permissions, groups, applications, and other information related to an organization and its security. To allow Azure AD users to sign in to your application, you must register your application in a tenant of your own which is assigned a Tenant ID (Directory ID). During Assign Application to Role, select the Contributor role and not the Reader role. To obtain your Subscription ID, log in to the Azure portal and click Subscriptions on the slide-out menu on the left. Find the appropriate subscription and see your Azure Subscription ID associated with it. Note that if the Subscriptions tab is not visible, then click on More services > to find it. The Azure Subscription ID is like a billing unit for all of the services consumed in your Azure account, including virtual machines and storage. The Subscription ID is in the form of a Globally Unique Identifier (GUID). So, after a service principal account (instance of an application in a directory) has been created using the Azure portal, the following four pieces of information will be available within the Azure AD module. You can now use these values in the procedure below to add an Azure cloud instance as a provider to CloudForms. From the Type list, select Azure. Select a region from the Region list. One provider will be created for the selected region. In the Credentials section, enter the Client ID and Client Key; click Validate. Red Hat CloudForms provides the ability to discover a set of Microsoft Azure providers across all regions. Click (Configuration), then click (Discover Cloud Providers). Select Azure from the Discover Type list. In the Credentials section, enter your Azure Client ID, Client Key, Azure Tenant ID, and the Subscription ID for that tenant. Red Hat recommends using Amazon EC2’s Power User Identity and Access Management (IAM) policy when adding Amazon EC2 as a cloud provider in CloudForms. This policy allows those in the Power User group full access to AWS services except for user administration, meaning a CloudForms API user can access all of the API functionality, but cannot access or change user permissions. Further limiting API access limitations can limit Automate capabilities, as Automate scripts directly access the AWS SDK to create brand new application functionality. From the Type list, select Amazon EC2. Select the appropriate Zone if you have more than one available. Generate an Access Key in the Security Credentials of your Amazon AWS account. The Access Key ID acts as your User ID, and your Secret Access Key acts as your Password. Click Validate to validate the credentials. Red Hat CloudForms provides the ability to discover cloud providers associated with a particular set of Amazon EC2 account details. Select Amazon EC2 from the Discover Type list. Enter your Amazon EC2 User ID and Password. Reenter your password in the Verify Password field. By default, public AMIs from an Amazon EC2 provider are not viewable in Red Hat CloudForms. To make these images viewable, you must edit the main configuration file for the appliance. Syncing all public images may require additional memory resources. Also, bear in mind that syncing happens in each configured Amazon EC2 provider, which will require a similar amount of total memory resources. Navigate to the settings menu, then Configuration → Zone → Advanced. Select the configuration file to edit from the File list. If not already automatically selected, select EVM Server Main Configuration. Set the parameter to get_public_images: true to make public images viewable. Set the parameter to get_public_images: false to make public images not viewable. Optionally, configure an array of filters in public_images_filters to restrict which images are synced. See http://docs.aws.amazon.com/sdkforruby/api/Aws/EC2/Client.html#describe_images-instance_method for more details. Amazon’s AWS Config notifies subscribers of changes in a region through its Simple Notification Service (SNS). Red Hat CloudForms subscribes to the SNS service for AWS Config deltas and converts the deltas into Red Hat CloudForms events. Enable the AWS Config service in the AWS Management Console. See the AWS Config Developer Guide for more information. Create a new Amazon SNS topic named AWSConfig_topic. Red Hat CloudForms automatically connects to this topic. (Optional) Configure the frequency of delta creation in the AWS Management Console. You can assign Red Hat CloudForms policies to the AWS events listed below. The appliance performs a provider refresh on all these events except for AWS_EC2_Instance_UPDATE. After adding an Amazon EC2 provider and configuring an SNS topic in Section 4.3.5, “Enabling AWS Config Notifications”, create a CloudTrail, then configure CloudWatch rules on your EC2 provider to automatically get events in CloudForms for monitoring the provider. The following procedures are accurate at time of publishing. See the Amazon AWS documentation for further details on these steps. Create a Trail with a custom name. (Optional) If you want to apply the trail to all of your CloudForms regions, select Yes for Apply trail to all regions. For Management Events, select Read/Write events: All. Create a new S3 bucket. In the CloudWatch area of the AWS Management Console, create three rules: one rule each for EC2, volumes, and snapshots. When an SNS topic is deleted and recreated (manually or by CloudForms), CloudWatch rules must be recreated as well, even though the SNS target topic for CloudWatch rules appears to be assigned to these rules. The CloudWatch rule does not send events to this recreated topic until it is recreated too. Navigate to Events → Rules and click Create rule. Select the Event Pattern radio button to specify the event source. Click Configure Details to save these details. Configure a name and description for the rule if desired. Ensure the Enabled checkbox is selected for State. Click Create rule to save the CloudWatch rule. EC2 can now automatically refresh events in CloudForms. After initial installation and creation of a Red Hat CloudForms environment, add a Google Compute Engine provider by following this procedure. You can generate a private JSON key for your project in IAM & Admin → Service Accounts in Google Cloud Platform. This key is used to authenticate against your provider. For additional information, see the Google Cloud Platform documentation at https://cloud.google.com/storage/docs/authentication. From the Type list, select Google Compute Engine. Select your Preferred Region from the list. Enter your Google Compute Engine Project ID for Project. Select the appropriate Zone if you have more than one available. Red Hat recommends creating a new zone for your Google Compute Engine provider. Copy your project’s Service Account JSON key contents to the Service Account JSON field. After adding Google Compute Engine as a provider in Red Hat CloudForms, enable events for the provider so that you can monitor the system from Red Hat CloudForms. Events are set up on a per-project basis by using Google Stackdriver logging combined with Google Pub/Sub. Stackdriver logging is a service that aggregates and exposes log events from Google services and applications. Stackdriver exports the log events to Google Pub/Sub, a messaging service. This section describes how to export activity log entries for a Google Compute Engine project so that events are captured in Red Hat CloudForms. You must have owner permission on the project you are exporting. In Google Cloud Platform, select your project from the top menu bar. Click to show the Products and Services menu. Click API Manager to go to https://console.cloud.google.com/apis/library/. In the API Manager Overview tab, search for Pub/Sub in the Google APIs search bar and select Google Cloud Pub/Sub API from the results. Click the Enable button. If Google Cloud Pub/Sub API is already enabled, the Enable button will not show, and instead Google Cloud Pub/Sub API will be listed under Enabled APIs. In Google Cloud Platform, select your project and navigate to Products and Services → IAM & Admin → IAM to go to https://console.cloud.google.com/iam-admin/iam/. If the cloud-logs@system.gserviceaccount.com account is already listed under Members, ensure Logs Configuration Writer is selected under Role(s). Click Add to add the permissions. In the dialog box, enter cloud-logs@system.gserviceaccount.com in Members to add the Google APIs service account to the permissions list. In the Select a Role dropdown, select Logging → Logs Configuration Writer and click Add. In Google Cloud Platform, click to show the Products and Services menu, and click Logging to go to https://console.cloud.google.com/logs/. Select your project from the top menu bar. Click Exports from the Logging menu. In the Select service list, select Compute Engine. Under Export these sources, click Add item, and select compute.googleapis.com/activity_log from the list. In the Create Cloud Pub/Sub Topic dialog, enter manageiq-activity-log as the Name. Click Create. When changes occur to Google Compute Engine instances, Red Hat CloudForms is now notified and reports these changes as events. 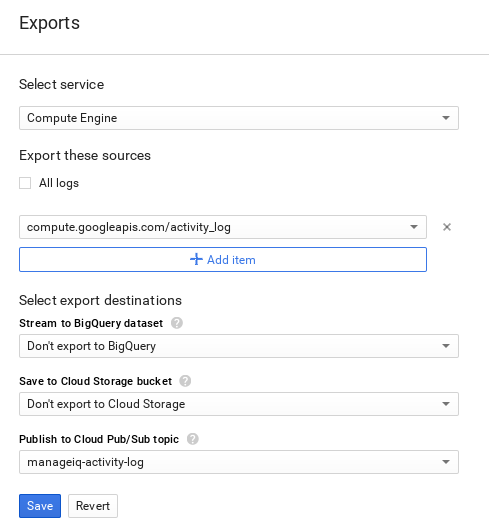 For information on setting up a cloud logging export on Google Cloud Platform, see https://cloud.google.com/logging/docs/export/configure_export. For information on Google Cloud Pub/Sub API operations and costs, see https://cloud.google.com/pubsub/. Navigate to Compute → Clouds → Providers and select your Google Compute Engine project. Click Monitoring → Timelines on the provider summary page to see an events timeline for the project. Refresh a cloud provider to find other resources related to it. Ensure the chosen cloud providers have the correct credentials before refreshing. Select the checkboxes for the cloud providers to refresh. Apply tags to all cloud providers to categorize them together at the same time. Select the checkboxes for the Cloud Providers to tag. A cloud provider might require removal from the VMDB if it is no longer in use. Check the cloud providers to remove. Click (Configuration), and then (Remove Cloud Providers from the VMDB). Edit information about a provider such as the name, IP address, and login credentials. The Type value is unchangeable. To use a different cloud provider, create a new one. Click the cloud provider to edit. Click (Configuration), and then (Edit Selected Cloud Provider). Edit the Basic Information. This varies depending on the Type of provider. Fill out the Credentials by typing in a Username, Password, and a verification of this password (Confirm Password). If selecting Amazon EC2, generate an Access Key in the Security Credentials of your Amazon AWS account. The Access Key ID acts as your User ID, and your Secret Access Key acts as your Password. If selecting OpenStack, use the Keystone User ID and Password for your login credentials. If editing an OpenStack provider, use the AMQP subtab to provide credentials required for the Advanced Message Queuing Protocol service on your OpenStack Nova component. Click Validate and wait for notification of successful validation. View the timeline of events for instances registered to a cloud provider. Click the desired cloud provider for viewing the timeline. Click (Monitoring), and then (Timelines). Use the Type list to select hourly or daily data points. The three Event Groups list allow you to select different groups of events to display. Each has its own color. From the Level list, select a Summary event, or a Detail list of events. In Red Hat CloudForms, a network manager is an inventory of networking entities on existing cloud and infrastructure providers managed by your CloudForms appliance. This provider type exposes software-defined networking (SDN) providers including OpenStack Network (Neutron), Azure Network, Amazon EC2 Network, and Google Cloud Network, which enables software-defined networking inventory collection. The OpenStack Network provider collects inventory of floating IPs from OpenStack so that IPs can be allocated without querying OpenStack database every time. Also, it refreshes all Neutron data from both OpenStack and OpenStack Infrastructure, and extracts the Neutron logic to a shared place. Note that management via the network providers configuration is currently disabled. This chapter describes the different types of network managers available to CloudForms, and how to manage them. Network managers are discovered automatically by CloudForms from other connected providers. All supported network providers — OpenStack Network, Azure Network, and Amazon EC2 Network, are added or removed automatically upon adding or removing the respective cloud provider. Navigate to Networks → Providers to see a list of all network providers, along with information such as Name, Type, EVM Zone, Number of Instances, Subnets, and Region. Click on a provider from the list to view its summary screen. The summary screen includes tables containing information on Properties, Status, Relationships, Overview, and Smart Management. Click on rows in the Relationship and Overview tables to see detailed information for individual entities. Accordion tabs in the sidebar provide access to Properties and Relationships details. Click on Reload, Configuration, Policy, and Monitoring actions in the taskbar to manage the selected provider. Alternatively, click on a cloud provider to see the cloud provider details and its relationships such as Network Manager, Tenants, Instances among others. In Relationships, click Network Manager to see information about the network provider, and its relationship with the cloud provider, on the summary page. Refresh a network provider to find other resources related to it. Ensure the selected network providers have the correct credentials before refreshing. Navigate to Networks → Providers. Select the network providers to refresh. Apply tags to network providers to categorize them together at the same time. Select the network providers to tag. Although network providers are added or removed automatically upon adding or removing the respective cloud provider, you can manually remove a network provider if it is no longer in use. This will remove the network provider from the VMDB and any relationship with the cloud provider. Click the network provider to remove. Click (Configuration), and then (Remove this Network Provider from the VMDB). View the timeline of events for instances registered to a network provider. Click the network provider you want to monitor the timeline for. From Options, select the event type and interval, and customize the period of time to display and the types of events to see. Select Management Events or Policy Events from the Show list. Select an Interval between Hourly and Daily. If you selected Daily for Interval, set the number of days in the past to see the event timeline for. The maximum is 31 days back. Select Summary or Detail for Level. Select the required Event Groups from the lists you want to monitor the timeline for. You can also assign policy profiles to network providers, or remove them. The method for doing so is similar to that of any normal policy profile. See Assigning Policy Profiles to a Network Provider and Removing Policy Profiles from a Network Provider in the Policies and Profiles Guide. The Topology widget is an interactive topology graph, showing the status and relationships between the different entities of the network providers that Red Hat CloudForms has access to. The topology graph includes cloud subnets, virtual machines, security groups, floating IP addresses, cloud networks, network routers, cloud tenants, and tags within the overall network provider environment. Each entity in the graph displays a color indication of its status: green indicates an active entity, while red indicates inactivity or an issue. Navigate to Networks → Topology. Click the desired network provider for viewing the provider summary. Alternatively, you can open the topology widget from the provider summary page by clicking Topology under Overview. Hovering over any individual graph element will display a summary of details for the individual element. Double-click an entity in the graph to navigate to its summary page. Drag elements to reposition the graph. Click the symbols in the legend at the top of the graph to show or hide entities. Click the Display Names checkbox to show or hide entity names. Click Refresh to refresh the display of the network provider entities. Enter a search term in the Search box to locate an entity by full or partial name. In Red Hat CloudForms, a middleware provider is a middleware management environment that you can add to a Red Hat CloudForms appliance to manage and interact with the resources in that environment. This chapter describes the middleware provider that you can add to Red Hat CloudForms, and how to manage them. The middleware provider extends CloudForms management capabilities to JBoss Middleware application containers running in managed virtual machines, hosts, and Linux containers. The provider delivers inventory, events, metrics, and power operations. 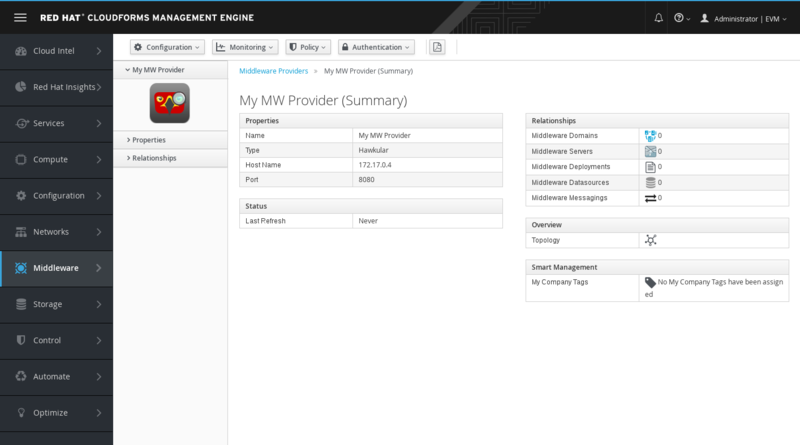 Middleware management in CloudForms is a provider based on the Hawkular open source project. When feature complete, the middleware provider will replace the current Red Hat middleware management offering, JBoss Operations Network. This release of the middleware provider is a Technology Preview. Technology Previews provide early access to upcoming product innovations, allowing you to test new features and provide feedback during the development process. Technology Preview releases are not intended for production use. For more information on the support scope for features marked as technology previews, see Technology Preview Features Support Scope. After initial installation and creation of a Red Hat CloudForms environment, add a middleware provider to the appliance. Navigate to Middleware → Providers. Click (Configuration), then click (Add a New Middleware Provider). Enter a Name for the provider, for example, Middleware Manager. From the Type list, select Hawkular. To use SSL to authenticate the provider, the middleware management server must be started with the service option HAWKULAR_USE_SSL=true. SSL (SSL with validation) – Authenticate the provider securely using a trusted certificate authority. This requires that you have already configured your public and private keys in the /client-secrets directory as either two .PEM files or as a single .pkcs12 file. SSL trusting custom CA – Authenticate the provider with a self-signed certificate. For this option, copy your certificate’s text to the Trusted CA Certificates field in .PEM format. SSL without validation – Authenticate the provider insecurely (not recommended). Non-SSL – Select if you do not want to use SSL. Enter the Hostname or IPv4 or IPv6 address of the machine where you installed the middleware manager. Enter the API Port of the middleware manager. The default is 8080. Enter the User Name used to start the middleware manager. This should match the HAWKULAR_USERNAME. Enter the Password used to start the middleware manager. This should match the HAWKULAR_PASSWORD. Reenter the password in the Confirm Password field. Click Validate to confirm that the user has the proper credentials. Click (Configuration), then click (Refresh Items and Relationships). A containers provider is a service that manages container resources, that can be added to the Red Hat CloudForms appliance. How many containers exist in my environment? Does a specific node have enough resources? How many distinct images are used? Which image registries are used? Entities such as pods, nodes, or services. Basic relationships between the entities, for example: Which services are serving which pods? Advanced insight into relationships, for example: Which two different containers are using the same image? Additional information, such as events, projects, routes, and metrics. You can manage policies for containers entities by adding tags. All containers entities except volumes can be tagged. This chapter provides details on managing containers providers. For details on working with the resources within a container environment, see Container Entities in Managing Infrastructure and Inventory. When deploying OpenShift using openshift-ansible-3.0.20 (or later versions), the OpenShift Container Platform service account and roles required by Red Hat CloudForms are installed by default. See the OpenShift Container Platform documentation for a list of the default roles. Use the OpenShift Cluster Metrics plug-in to collect node, pod, and container metrics into one location. This helps track usage and find common issues. Configure Red Hat CloudForms to allow for all three Capacity & Utilization server roles. 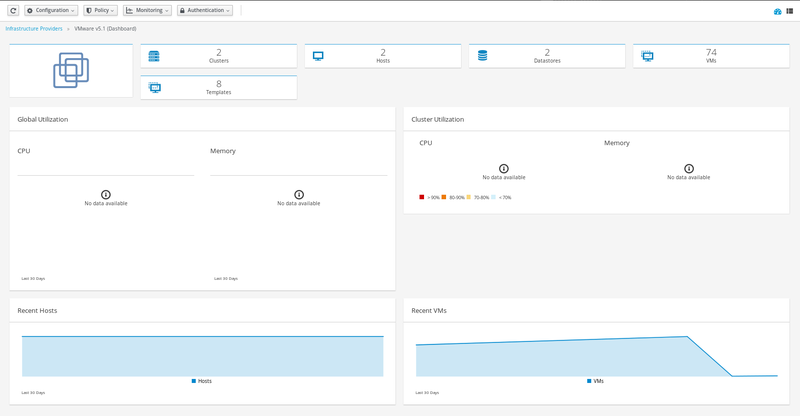 Enable cluster metrics using the OpenShift Container Platform documentation. After initial installation and creation of a Red Hat CloudForms environment, add an OpenShift Container Platform provider using the token obtained in Section 7.1, “Obtaining an OpenShift Container Platform Management Token” and following the procedure below. Navigate to Compute → Containers → Providers. Click (Configuration), then click (Add Existing Containers Provider). From the Type list, select OpenShift Container Platform. Enter the appropriate Zone for the provider. If you do not specify a zone, it is set to default. SSL: Authenticate the provider securely using a trusted Certificate Authority. Select this option if the provider has a valid SSL certificate and it is signed by a trusted Certificate Authority. No further configuration is required for this option. SSL trusting custom CA: Authenticate the provider with a self-signed certificate. For this option, copy your provider’s CA certificate to the Trusted CA Certificates box in PEM format. To obtain your OpenShift Container Platform provider’s CA certificate, run the oc get secret command on your provider, substituting values for your provider and token as needed. To obtain a token for your provider, see Section 7.1, “Obtaining an OpenShift Container Platform Management Token”. Paste the output (a block of text starting with -----BEGIN CERTIFICATE-----) into the Trusted CA Certificates field. SSL without validation: Authenticate the provider insecurely (not recommended). Enter the Hostname or IPv4 or IPv6 address of the provider. The Hostname must use a unique fully qualified domain name. Enter the API Port of the provider. The default port is 8443. Enter the OpenShift management token in the Token field. This is the token obtained earlier in Section 7.1, “Obtaining an OpenShift Container Platform Management Token”. Enter the same token in the Confirm Token field. Click Validate to confirm that Red Hat CloudForms can connect to the OpenShift Container Platform provider. Enter the API Port if your Hawkular provider uses a non-standard port for access. The default port is 443. Click Validate to confirm that Red Hat CloudForms can connect to the Hawkular endpoint. Apply tags to all containers providers to categorize them together at the same time. Select the checkboxes for the containers providers to tag. Select a tag to assign from the drop-down menu. You may want to remove a containers provider from the VMDB if the provider is no longer in use. Select the checkboxes for the containers providers to remove. Click (Configuration), and then (Remove Containers Providers from the VMDB). Edit information about a provider such as the name, hostname, IP address or port, and credentials. Click the containers provider to edit. Click (Configuration), and then (Edit Selected Containers Provider). To use a different containers provider, create a new one. Edit the Credentials by typing in a new Token. View the timeline of events for instances registered to a containers provider. Click the desired containers provider for viewing the timeline. From the Level dropdown, select a Summary event, or a Detail list of events. The three Event Groups dropdowns allow you to select different groups of events to display. Each has its own color. Click on an item for more detailed information. In Red Hat CloudForms, a storage manager is a service providing storage resources that you can manage from a Red Hat CloudForms appliance. This chapter describes the different types of storage managers used by Red Hat CloudForms, and how they are added to Red Hat CloudForms. The Amazon Elastic Block Store service provides and manages persistent block storage resources that Amazon EC2 instances can consume. To use the Amazon Elastic Block Store service as a storage manager, you must first add an Amazon EC2 cloud provider to your Red Hat CloudForms appliance. The Amazon Elastic Block Store service is automatically discovered by Red Hat CloudForms, and added to the Storage Managers list. See Section 4.3.2, “Adding Amazon EC2 Providers” for instructions on adding an Amazon EC2 cloud provider. For information on managing the inventory available to Amazon Elastic Block Store managers, see Volumes in the Managing Infrastructure and Inventory guide. The OpenStack Block Storage service (openstack-cinder) provides and manages persistent block storage resources that OpenStack infrastructure instances can consume. To use OpenStack Block Storage as a storage manager, you must first add an OpenStack cloud provider to your Red Hat CloudForms appliance and enable events. The Block Storage service will be automatically discovered by Red Hat CloudForms and added to the Storage Managers list in Red Hat CloudForms. See Section 4.1.1, “Adding OpenStack Providers” for instructions on adding a cloud provider and enabling events. For information on managing the inventory available to OpenStack Block Storage managers, see Volumes in the Managing Infrastructure and Inventory guide. The OpenStack Object Storage (openstack-swift) service provides cloud object storage. To use the OpenStack Object Storage service as a storage manager, you must first add an OpenStack cloud provider to your Red Hat CloudForms appliance and enable events. The Object Storage service will be automatically discovered by Red Hat CloudForms and added to the Storage Managers list in Red Hat CloudForms. See Section 4.1.1, “Adding OpenStack Providers” for instructions on adding a cloud provider and enabling events. The object store summary page shows details including the object store’s size, parent cloud, storage manager, cloud tenant, and the number of cloud objects on the object store. Navigate to Storage → Object Stores to display a list of object store containers. Click a container to open a summary page for that object store container. Click Cloud Objects to view a list of object stores in the object store container. Click an object store from the list to view the object store’s summary page. Cross-providers insight is a feature that connects all layers of infrastructure, cloud, and containers known to Red Hat CloudForms and collects data for analysis. The collected information includes all the data available in other (infrastructure or cloud) providers. For Amazon EC2 (AWS) and Google Cloud Engine (GCE) support, OpenShift must be installed using the relevant cloud provider. For more information, see the OpenShift Container Platform Installation and Configuration Guide, ensuring you use the desired version of OpenShift. Adding a self-signed Certificate Authority (CA) certificate for SSL authentication requires additional configuration on OpenStack Platform and Microsoft System Center Virtual Machine Manager (SCVMM) providers. This procedure is not required for OpenShift Container Platform, Red Hat Virtualization, or middleware manager providers, which have the option to select SSL trusting custom CA as a Security Protocol in the user interface. These steps are needed only for providers without this option in the user interface. Copy your provider’s CA certificate in PEM format to /etc/pki/ca-trust/source/anchors/ on your CloudForms appliance. The CA certificate is added to the appliance, and you can add the provider to CloudForms.